A Quest is divided into Episodes. Each episode covers a lesson in game design, taught over a number of Missions, in one of three types: Play, Repair, and Build. This sequence shows the player an element of game design in action, then asks them to fix a game and finally lets them build a game around that topic. An episode begins and ends with a comic that sets the scene. 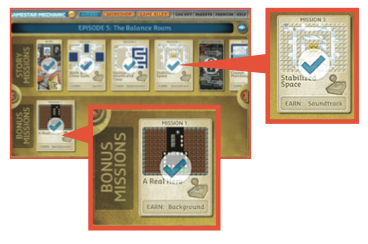 Play Missions require the user to successfully complete the play of a pre-designed game by accomplishing the set objectives. Play Missions usually serve to introduce users to the behavior of Sprites. Repair Missions present the user with a game that is in some way broken and cannot be successfully played. The user must deduce what is broken about the game and use the Gamestar Mechanic console to place or remove objects. A set of requirements will be presented that the repaired game must include, such as “Place 10 enemies.” The mission is completed when the player has successfully played and accomplished the objectives of the repaired game. Build Missions present the user with a blank slate to build a new game on. A set of requirements will be presented that the game must include, such as “Place 10 enemies. ” The mission is completed when the player has successfully played and accomplished the objectives of their created game. Bonus Missions are either Play Missions, Repair Missions or Build Missions and do not need to be completed to continue in the Quest. After each mission, story or bonus, is completed, the player is rewarded with sprites and other rewards such as backgrounds and music to use in their Toolbox.